Submitfrog.com now offers a manual video submission service to aid in your video submission efforts. Our video submission is a manual video submission service that will do a video submission to all major video site, social media sites and traditional search engines. Submit Videos toincrease page rank. One way links to increase pagerank. If you are looking to distribute videos to the Video Submission sites, you should definitely use our team at SubmitFrog.com. We provide the best cost effective services that you will find on the internet at the best price. We take proud to be the first company to offer video submission service after testing it for months. All Video submissions is done Manually by trained staff members to sites like youtube, meta cafe, google video and more. We offer around the clock customer services and 100% guarantee that our services will be up to your expectations. All video submission sites are High traffic, SEO friendly, High rate of success, Known and Proven. We make sure that you completely understand the impact and the effectiveness of our video submissions and distributions. Most of our video sites we submit have a minimum PR of 5 and millions of visitors a month. A detailed report of Video Submission sites will email to you after submissions. Unlike other video submission firms who use automated submissions, we at SubmitFrog.com submit the videos manually to the top video distribution sites. 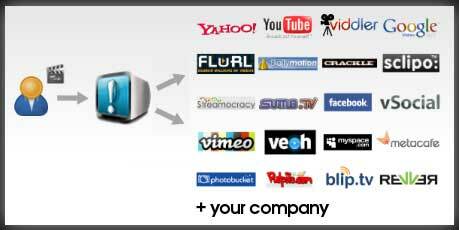 Manual video submission ensures the videos to get distributed in the top niche video distribution websites. Moreover, manual submission eliminates the risk of the videos getting submitted to a wrong category. Keeping the above factors in mind, our experienced team submits each video manually to the best suited category in the high ranked video distribution websites. Submitting the videos to a handful of video distribution websites will eat up much of your precious time. Moreover, if the submission is not done in the suitable category with appropriate tags, titles and description is a complete waste of time. With hands on experience in Video Search Engine Optimization, our team at SubmitFrog.com will ensure the correct inclusion of tags with appropriate tile and description for your videos. I purchased the 40 Popular sites package and I saw my videos on Google and YouTube in minutes.. My videos are getting great listings SPLENDING JOB!! Send me another as I have 4 more video to distribute. I have never seen video sites linking like this before on SEO ? Have you? WOW! I never imagined that a video could drive so much traffic to the site. Last week alone we got 4,200 unique hits over our normal traffic. Thank you for the great job. <> SubmitFrog.com is the World Wide Web’s premier video distribution service. <> SubmitFrog.com helps ensure your video is placed in front of many viewers as possible by submitting your video to 40 video sites, as well as ensuring that your video is fully optimized. <> The team at SubmitFrog.com has great submission experience. We distribute your videos to 40 popular video distribution sites with the relevant content. "We are on first page of Google now (took us TWO YEARS) for our major search term. We thank SubmitFrog.com for this. We were solid on SEO for 2 years, but I can definitively tell you now that SubmitFrog.com has pushed us up that one extra level (page) on Google."